Rejecting Six Literal Days - What's the Real Motivation? "Are they really arguing from Scripture using a grammatical-historical interpretive method? Or are they actually influenced by ideas outside of Scripture concerning the supposed old age of the universe/earth and the nature of what is deemed to be 'science'?" Read more about Rejecting Six Literal Days - What's the Real Motivation? Should We Doubt Young Earth Creationism? A response to: "The Bible nowhere directly teaches the age of the earth." Read more about Should We Doubt Young Earth Creationism? "[E]volution... cannot simply be grafted onto evangelical Christian faith as an add-on"
"Evolution requires that Genesis 1 is teaching theology but not teaching history. But is this an acceptable categorization of Genesis 1?" Read more about "[E]volution... cannot simply be grafted onto evangelical Christian faith as an add-on"
Pope: "Evolution in nature is not inconsistent with the notion of creation, because evolution requires the creation of beings that evolve"
Read more about Pope: "Evolution in nature is not inconsistent with the notion of creation, because evolution requires the creation of beings that evolve"
How can scientific naturalism be a child of Christian theology? That is a good question. One would think that such a methodology, disposed as it is to serve the worldviews of materialists and atheists, and presented by them as indispensable to good science, would have been contrived by them, but such is not the case. In the course of writing about the idea of science in his Systematic Theology, Reformed writer Michael Horton notes that “Britain’s Royal Society was founded by Puritans” (The Christian Faith, 339 n.48). Evolution is the atheist’s way out. It is his escape clause from having to face the God who created him. People like Richard Dawkins may convince themselves that it makes atheism intellectually respectable, but they must first convince themselves that naturalism is intellectually respectable. The problem here is that, as in many walks of life, it is possible to arrange our arguments selectively and with rhetorical conviction while ignoring the issues, even the most obvious ones. So if we begin to stack up the problems: – something does not come from nothing; life does not come from non-life; the mathematics of sequence space (not enough time); the contradiction of using target-oriented computer programs to “simulate” discrete non-targeted chance scenarios; the logical fallacies (question-begging, composition, reification), etc., these problems make the intellectual satisfaction appear rather hollow. It is a universal law which, as all scientific laws, has not witnessed an exception: life does not come from non-life. 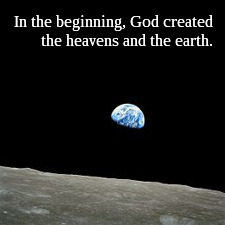 Yet evolutionists, of the non-theistic sort) must teach that it does. Going further back, ex nihilo nihil fit, out of nothing comes nothing. No one has ever seen or heard of something (i.e. that which has properties and permits predication) coming into existence from nothing (that which has no properties and does not permit predication). Yet evolutionist must adhere to the contradiction of this very basic principle. That is, unless they want to teach the eternity of matter. Is it a sign of rationality and a coherent system to flout two empirically static principles of science at the very outset of ones thinking? So how do they get around it?